My wife and I are at my parents condo in an undisclosed place in the northeast. After returning from the requisite haircut at the mall, I noticed a stack of boxes in the hallway enterance. While looking for the 96 gigs of ram I ordered, I spotted a lovely little package from fw. How on earth did fw get a package to my parents place in time for christmas? So now I have a wonderful new problem. 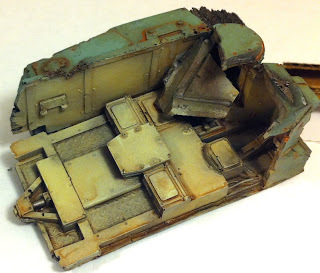 A resing forgworld model, and no way to build it! I supposed it evens out in the end. My wife wanted to try the game and we are playing. The game is a simple annihilation game with her as Blood Angels pitted against a Chaos war-band led by Typhus. 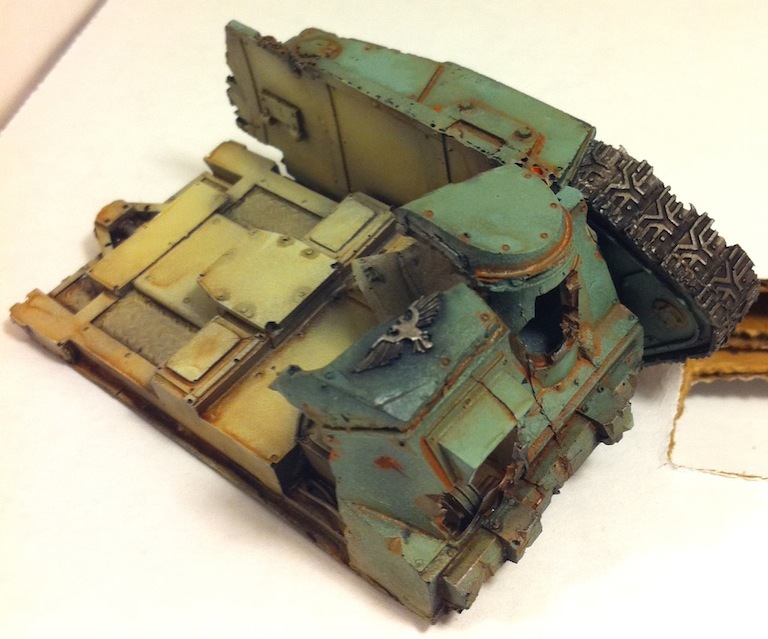 The battlefield is strewn with abandoned imperial guard tanks with a ruined imperial temple in the center. Her entire force is left, while mine consists of a single unit of 5 lessor demons and Typhus leading three terminators. It is rather surreal playing a game of 40k against her. Ultramarines Movie Review: It is terrible! 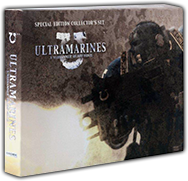 My copy of the Ultramarines DVD came in yesterday, and I promptly watched it as all fans of the genre are likely to do. The short answer is that this is a flat out terrible movie. The story is bland, the animation terrible, and the direction simply unbelievable. The marines move like toys, behave like amateur soldiers, and apparently allow enlisted to challenge officers orders. My wife offered to watch the movie with me, but had to go to an event. I thought the chance to share my hobby with her was such a cool opportunity. However after watching the movie, I will not sit through it again. I would not show this movie to anyone. It is such a shame since they have a normally good writer, and an excellent voice cast. Send this movie to /dev/null and forget about it! 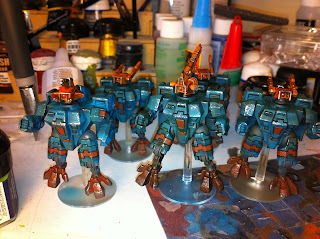 Since Tau can't function I thought I should add some highly weathered battle suits to my force. 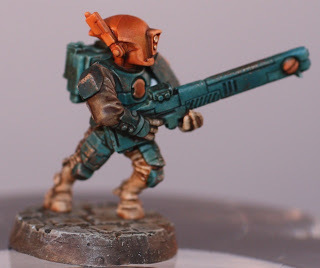 They match the color scheme for my veteran fire warriors (the ones that protect Etherial Jones). They started out with a careful air brushing of blues, creating a shaded effect. I then proceeded to spray on sepia wash to give them the aqua color you see here. I have a lot of additional weathering to do, in addition to decals. 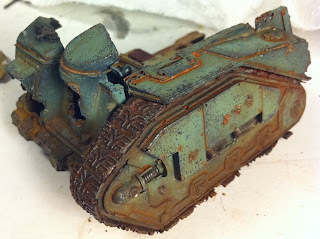 I am thinking about adding rust to the metal plates as well as going back and adding some edge highlighting. 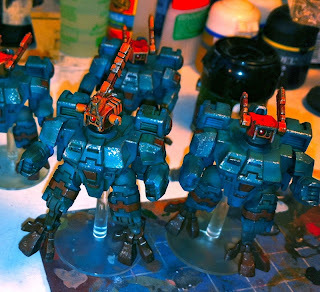 Basically my Tau force look like they have been through hell, so these guys will fit in nicely if I keep weathering them till they are right. My real camera takes much better photos than my iphone, but at the moment I am having a little painters block, so I am keeping away from the big camera setup and focussing on finishing minis. I don't normally review books, audio or otherwise on this blog, but today is an exception. 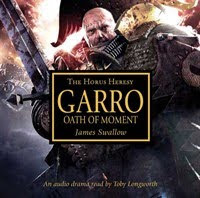 Garro Oath of Moment is a fantastic audio book, well worth buying. 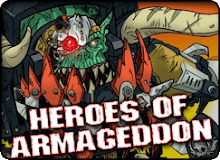 The sound effects are a bit much, but the story is great, and it finally answers one of the great 40k questions. The script written by Tob Longworth and James Swallow is great. I know Swallow gets a lot of grief from the BA fan boy club, but just like his fantastic Flight of the Eisenstein, this is definitely worth buying. The authors did an outstanding job. I know Tau Ethereals are supposed to be poor units, but I love the way this model looks, and am going to be hard pressed to not field him every time I get the chance. 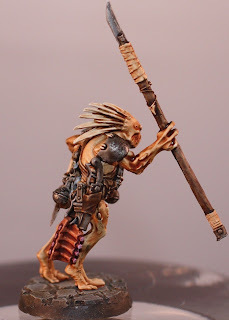 I have no idea why this model stands out to me so much, but it is a must have. 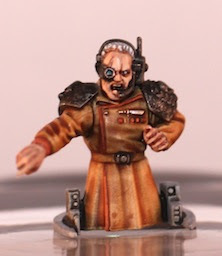 Commander Shadowsun is so-so at the moment. I have her based, and am ready to start adding some more detail. I plan to add both blue and dark red to the model somehow, though I Have not figured out how yet. I started back on my tau after basing my Death Guard champion. 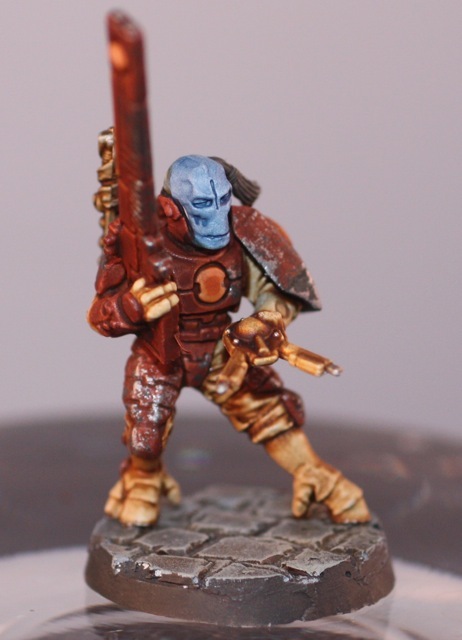 My tau needed an HQ, so I decided to paint shadowsun. I don't paint white very often, but I think the white is turning out ok. It does not photograph very well, but in person it looks pretty clean. the trick seems to be two coats of a grey wash followed by white edge high lighting. She will stand out really well in the army. 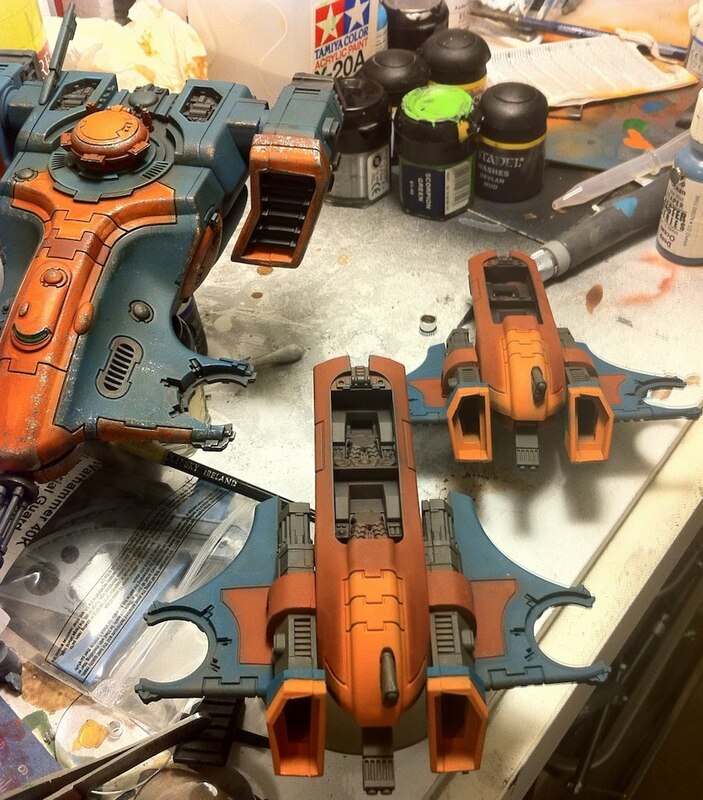 Some orange markings and battle damage are coming! I have not posted much since my blogger versus blogger game. 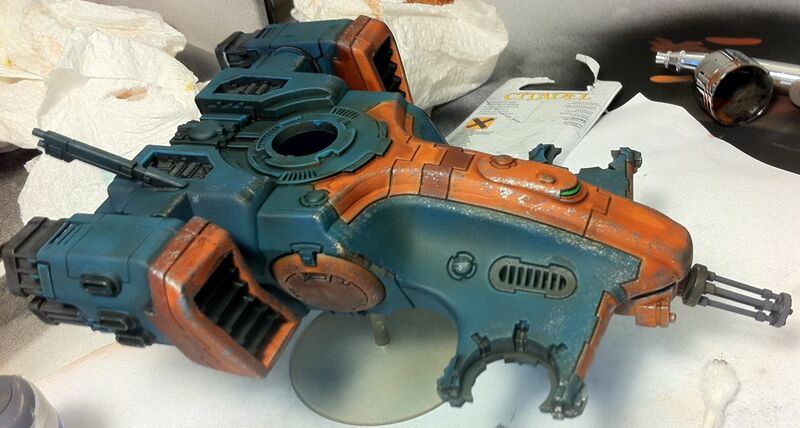 I sort of fell out of the painting cycle, and was focusing on airbrushing Tau tank after Tau tank. 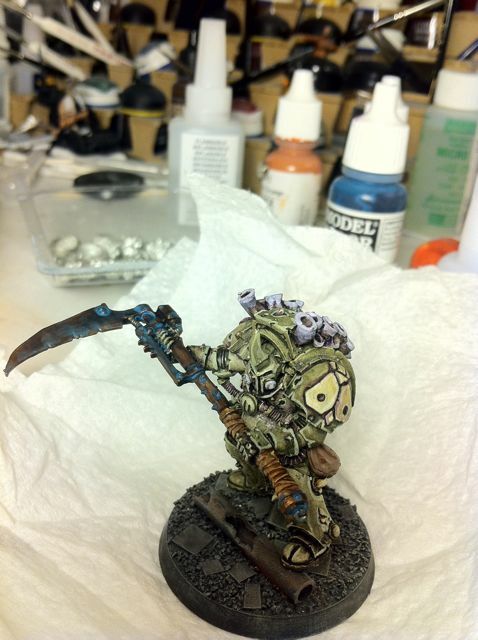 I almost painted Typhus by accident. The white primer was working really well last night, and he was sitting near by. 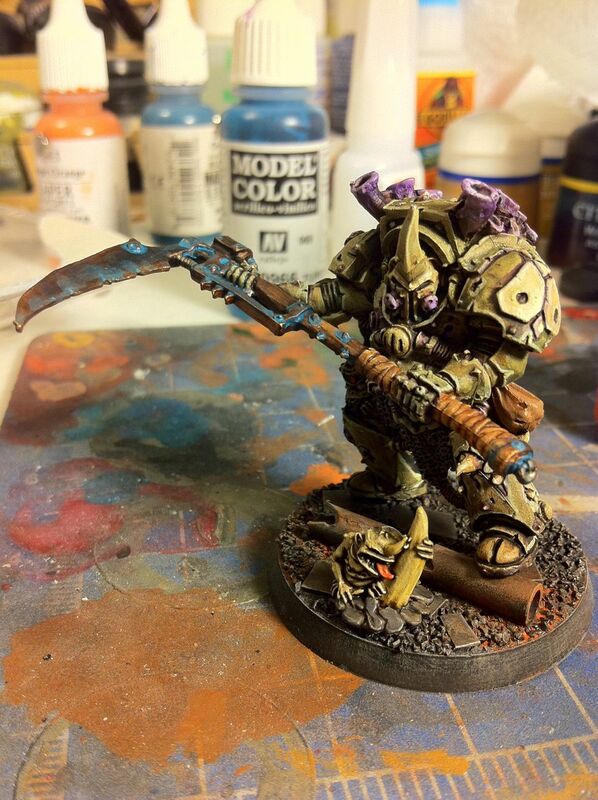 The tau Ethereal I was working on was drying, so I picked up Typhus and started painting. 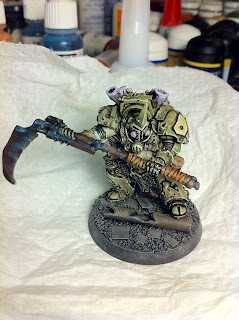 I painted him to match my plague marines, though I think he is a little better looking. 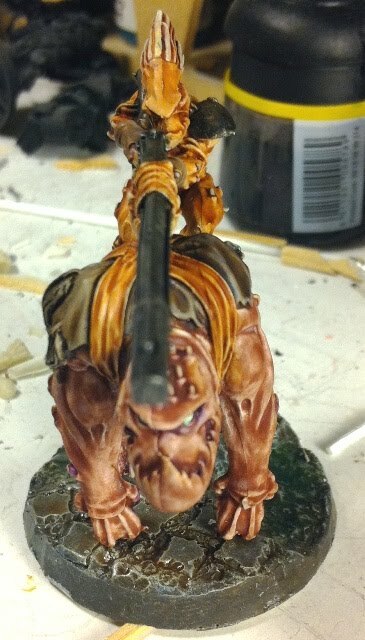 I have one more glaze to put on him to tie in all of the edge highlighting. Someday I may even field a Chaos army! I met Rob from Warhammer 39,999 last Friday, and we got in a fun game in using the battle missions book. I learned quite a bit about Alaska, before getting thoroughly stomped by my Dark Angels. Rob schooled me using an army with funky old rules, a pts deficit, and with poor rules familiarity on both of our parts. I'll leave the battle report to him, since he has the play by play. Suffice to say, I had a great time, and look forward to a rematch in San Diego! In other news, I'll need to post images of my Tau at some point. 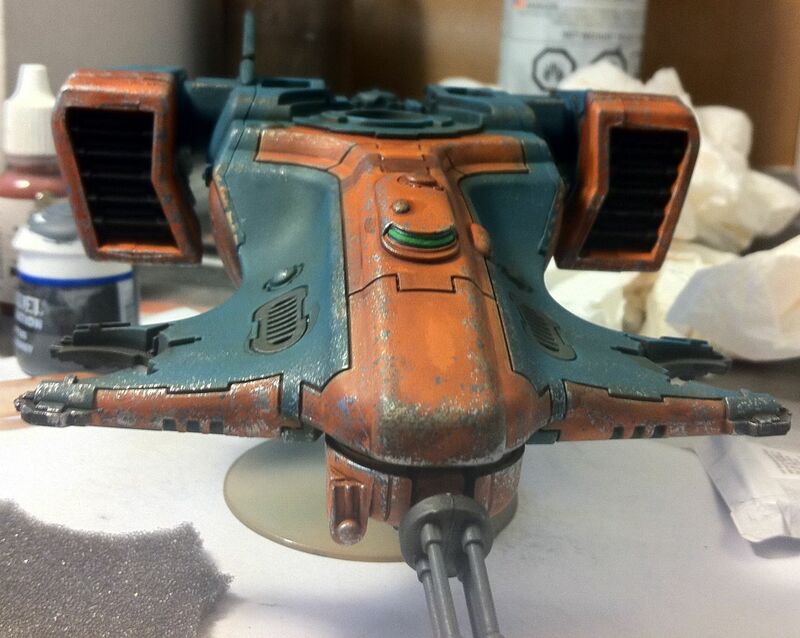 I have been painting gun drones by the bushelful, which is not particularly interesting, but does make the vehicles look much better. Next up is a small dark eldar force. 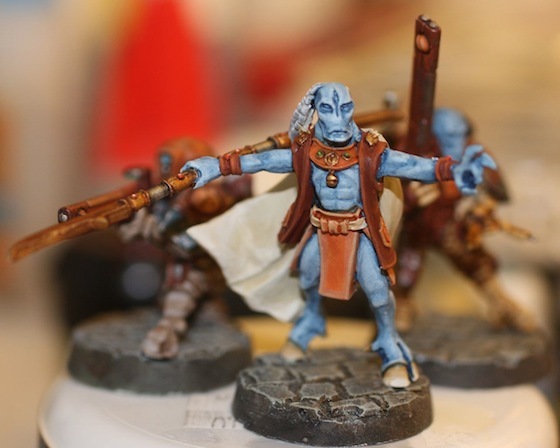 Yes, I bit the bullet and added yet another army to my painting table. The new plastics were just too good to pass up. I had painters block for a while, hence no updates, but fortunately it has passed. My Tau are progressing along now, with my first heavy guns painted. I really liked the way the grey pre-shading turned out on the suit, so I decided to paint in some highlight colors. I think the suits will be darker like this. Once I can't decide if I should paint up the 3 other devilfish chassis assembly line style, or if I should pause, finish off all of these pieces and then move on. 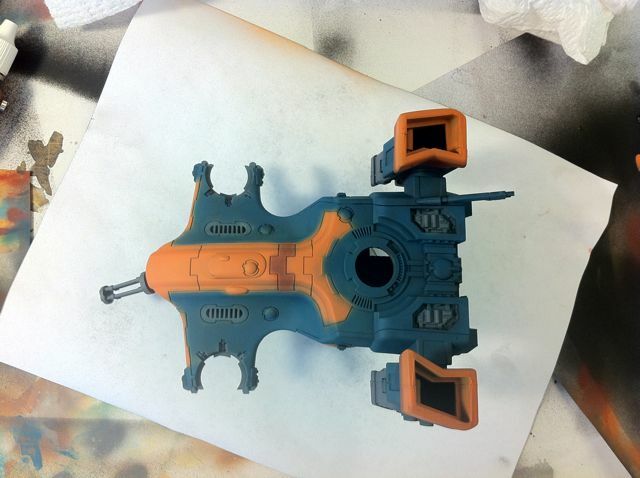 Here is a quick update to the devilfish. right before this step I hard lined the blue and orange areas and was really pleased with how the thing was looking. Then I tried shooting sepia through my air brush. That did not work out so well, so I had to resort to a brush to finish off adding the wash. Post wash it was two quick spongings and voila! 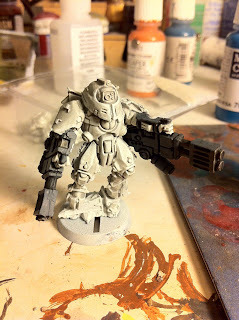 I have the forge world tau transfers, so I think I will try to get them on tonight. 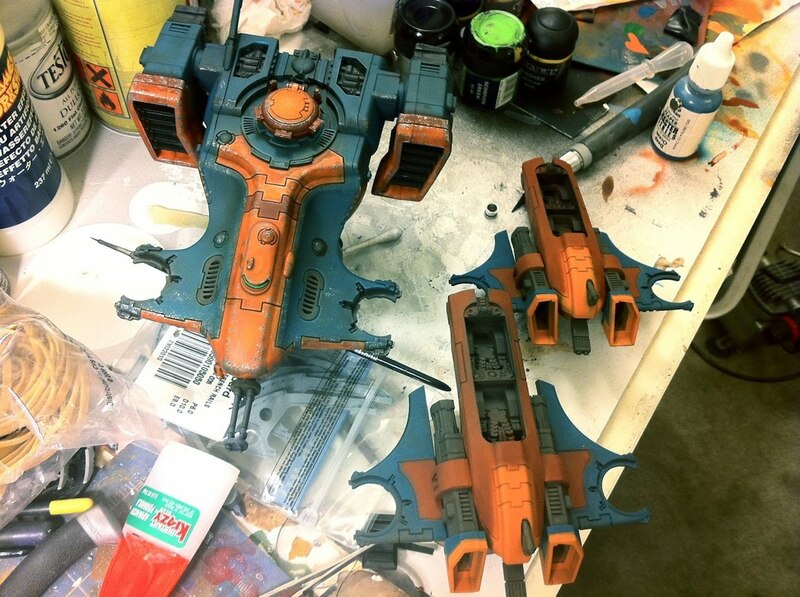 The gun drones and turret will be a combination of red and orange, much like my red fire warriors a few posts ago. I got my mojo back, and painted up two piranhas with my base color scheme since I first posted this. I went with a red body and green wings for these guys. 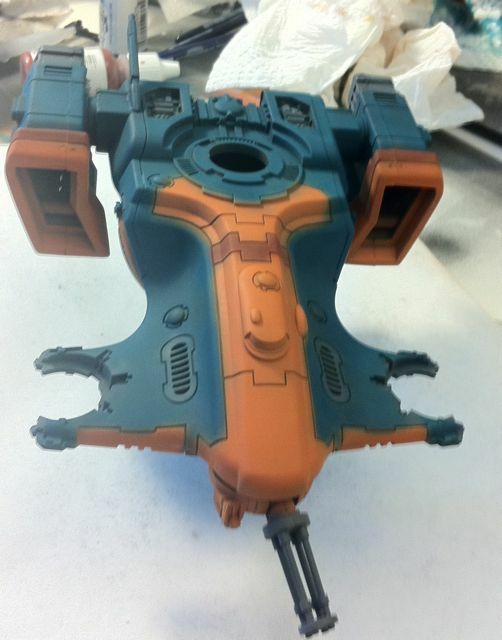 I also finished off the devilfish by adding the turret and hatch thing. 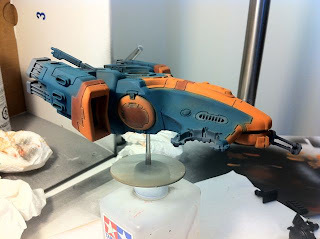 I took the nozzle off of my airbrush today and experimented with finely controlled airbrushing. I have a lot of tau tanks to paint, and I wanted to get the base colors laid down quickly so I could focus on weathering, transfers, and all the little grit and grime that I think will make these tanks shine. This tank goes with my turquoise squad. 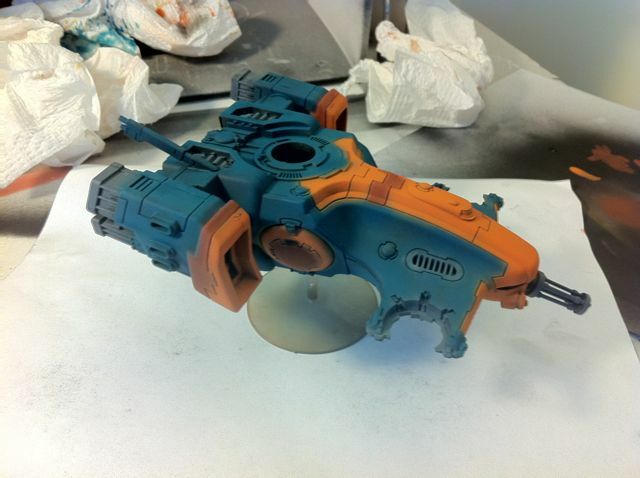 My next devilfish will have the turquoise and the rust red swapped. I think the devilfish will help to tie the army color together even though they are not going to be painted identically. It was a pretty good experiment. The lines are nowhere near as crisp as painting by brush, but I kind of dig the soft effect. 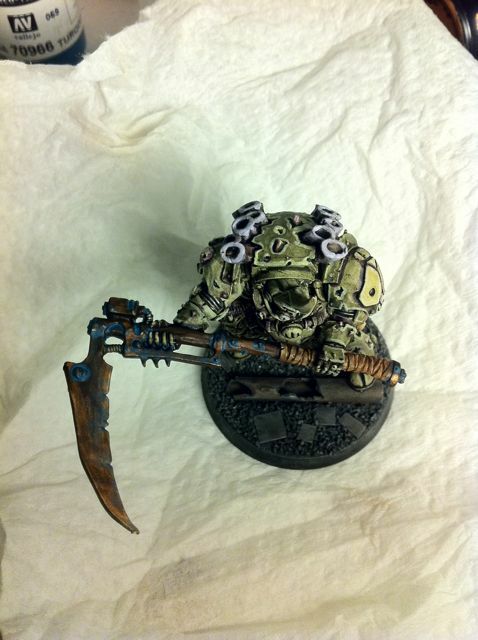 I think the next step is to put some shading on the thing, and then add the transfers. 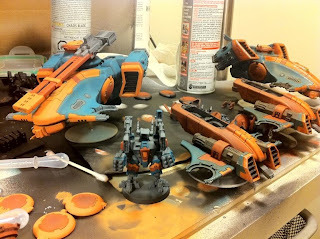 Post transfers come chipping, followed by gryphon sepia wash.
My plan was to take this long holiday weekend and paint up all of my tau tanks. 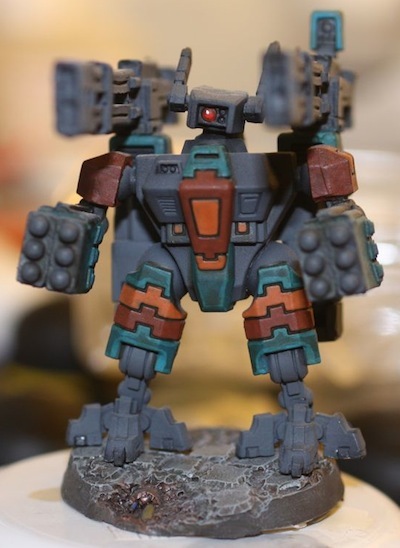 The goals was to push my tau force over the minimum pts limit so I could play a game. I managed to build all of the kits, trim all of the flash, and prime the devilfish and piranha chassis, but it is 7:00 PM now and I am beat. So my new more managable goal is to paint up at least one of the vehicles tomorrow. A speed painting freak I am, but I bit off much more than I could chew this time around. I managed to make my hobby as fun as installing kitchen cabinets! 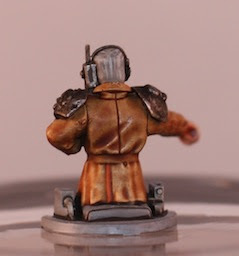 I painted this tank commander a while back as a potential color scheme for my Death Korps of Krieg army. I think I am going to make my own washes for the army instead of using sepia. The miniature was fun to paint though, and will probably find service in some tank from my cadian force. I used my new light box to take the photos. 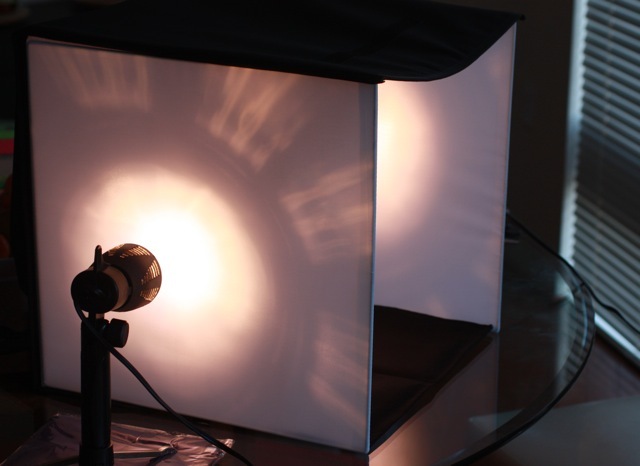 I think the problem is that I was lacking a good source of frontal light. I ordered a light box setup from Amazon a while back and decided to give it a spin today. 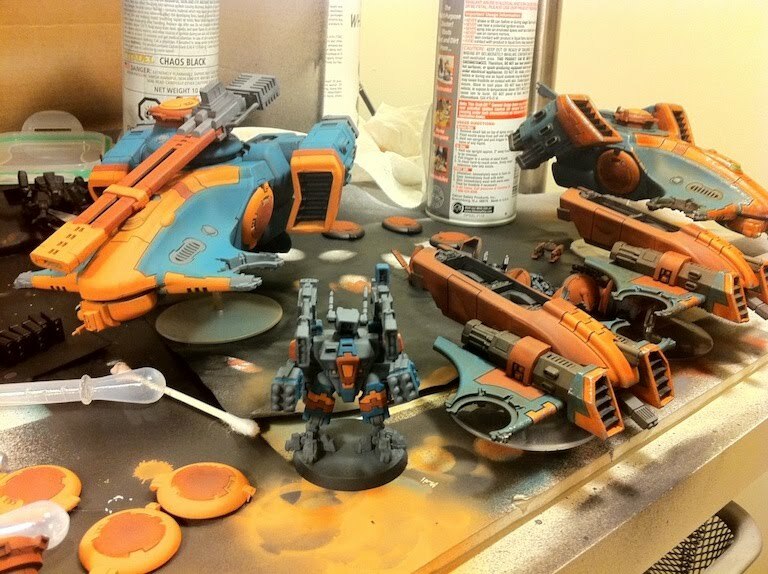 For my tau I've decided to paint them in three different color schemes, blue, red, and black. The blue and the red squads have orange accents, while the black squad has purple and blue accents. I am considering a green and orange color scheme for my pathfinders. I love the way the two squads. 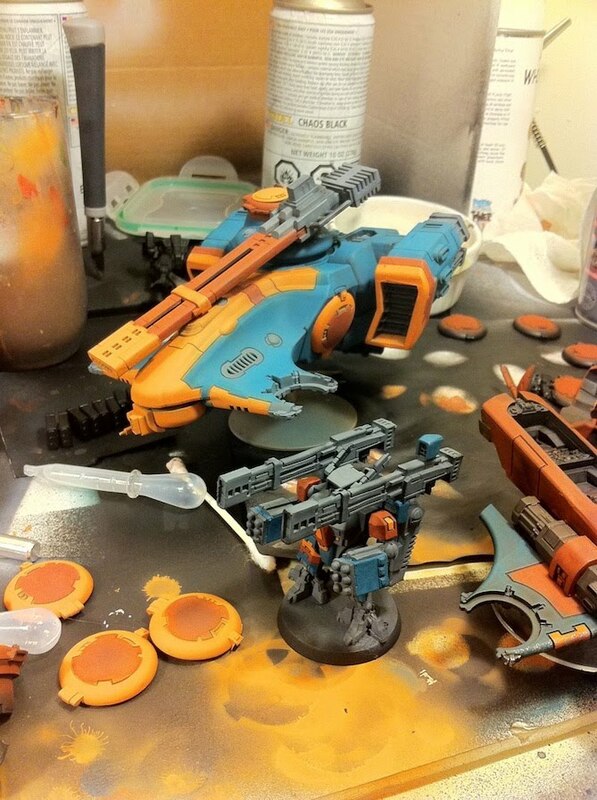 are starting to look together, especially the gun drones. My goal with Tau was to create a super easy to paint set of recipes that I could use to quickly paint up and weather a force. 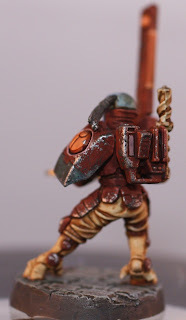 You might have noticed that my tau are beat up. 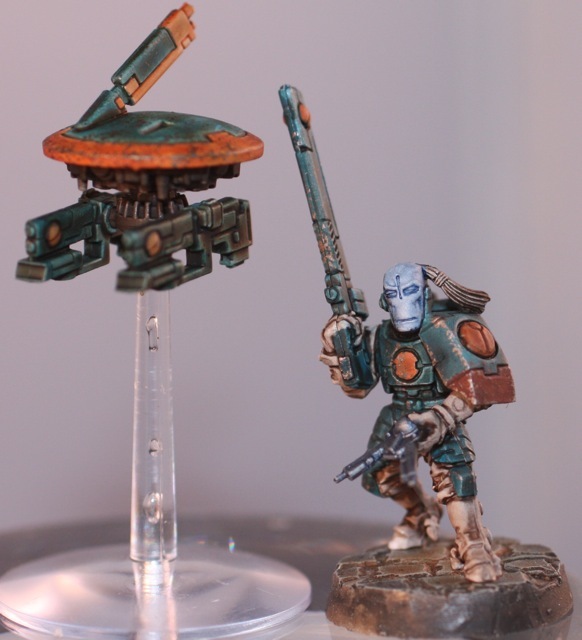 These are dirty tau, who have been on campaign for a long time, not the super clean tau normally seen. I hope my heavy handed weathering is serving to unify the the force. 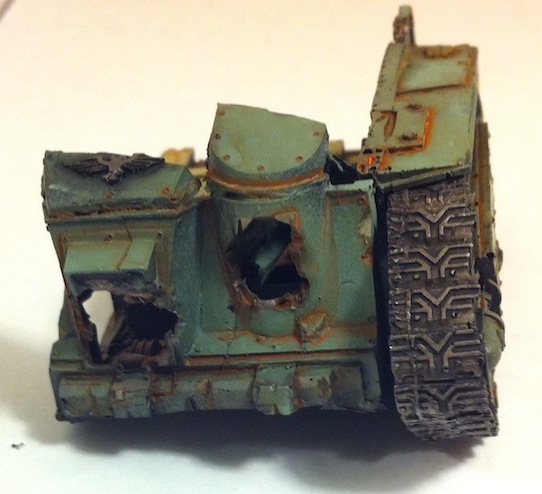 I've been buying DKOK stuff for a while now, and am only now getting started building it. My first task was to build the single LR chassis that will be part of my 1500 pt force. I am going mainly with centaurs, but want one LR. 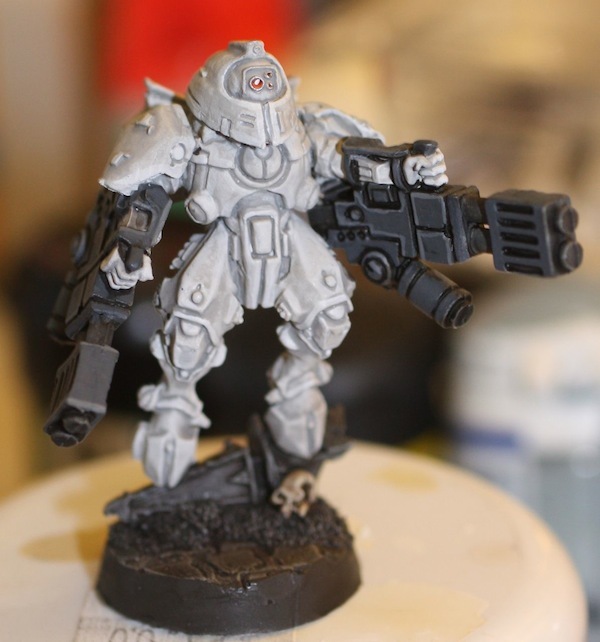 The old FW kits do not fit on the new model without some work. The good news is that it is not particularly difficult. The engine filter requires a portion of the back engine cover to be sawed off. 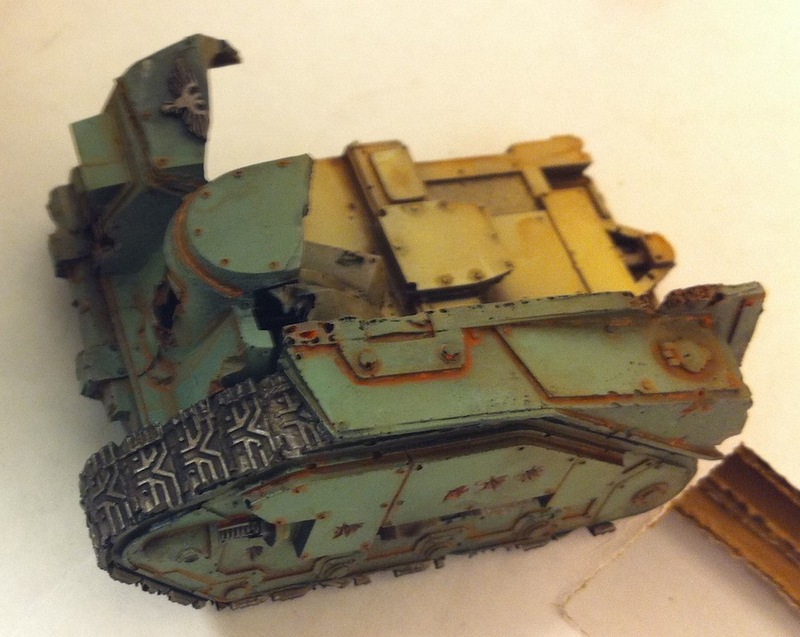 The trench rails simply do not fit. 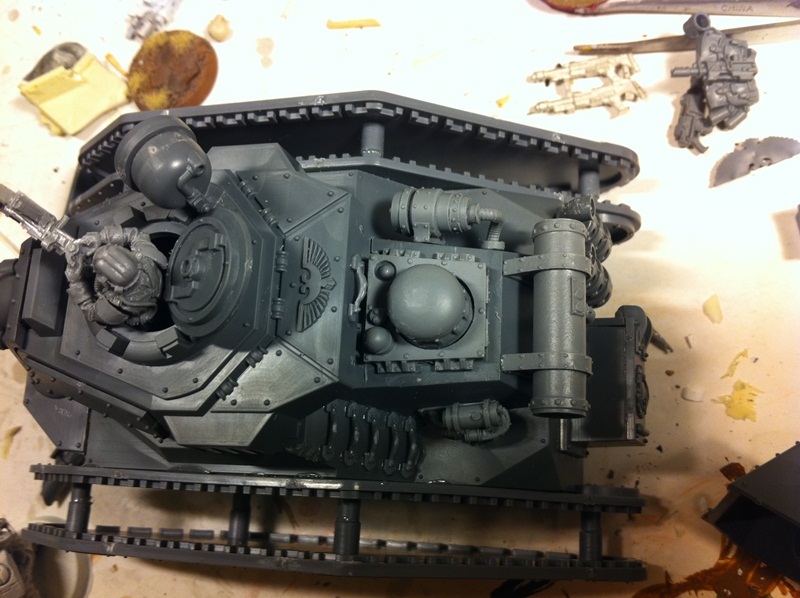 It turns out the FW full kit has a resin engine area. The tank gunner works, just not with the cool FW hatch because the new LR kit has the turret modeled on. 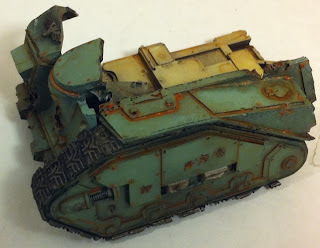 I am luke warm about losing the more interesting turret, since it has more detail, and helps make the tank look more interesting. In any case, I am happy I bought the upgrades. I think they add a lot of character to the tank. 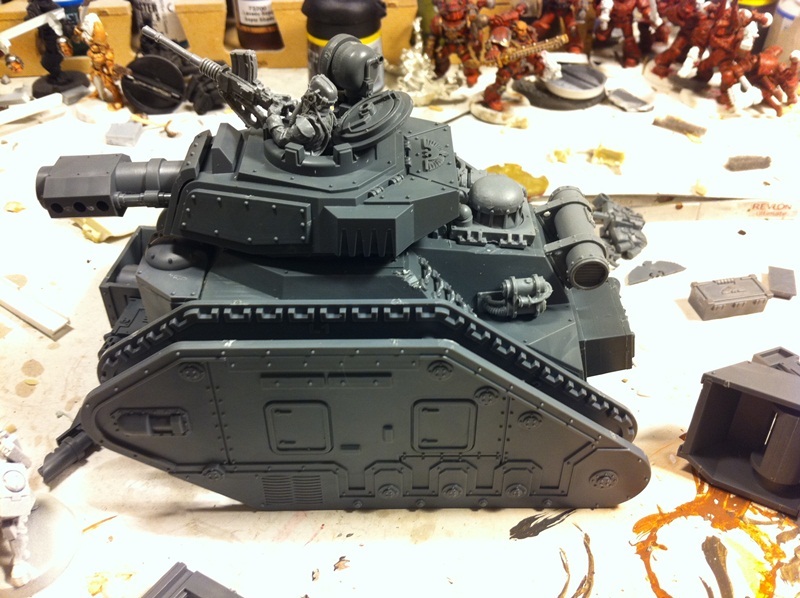 My plan is to run this as a regular old LR with battle cannon, hull las cannon, and bolter sponsons. It will support a static line of 2 teams of 3 heavy stubbers. 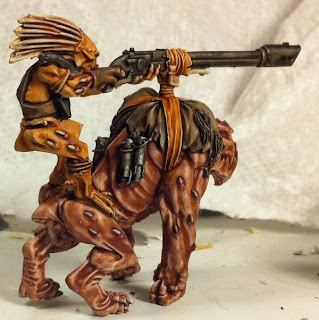 Grenadier squads in centaurs, hq in centaurs, and quartermaster in centaurs work as my ultra fast open topped gun platforms. A single squad of engineers and death riders bulks out the army. Most of the army is made up of AP3 weapons, so it should be pretty fun to play SM. 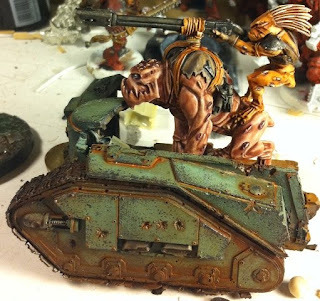 The centaurs have a built in gun mount so the heavy weapon from the squads embarked can fire. 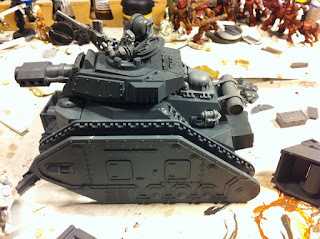 That gives me 2 heavy stubbers per centaur. I don't know what the Kroot riders are really called, but the thing the kroot is riding does look a little like a gorrilla. I painted this guy with washes, and I think the style contrasts really well with the ruined centaur. I am not sure more different styles could coexist! 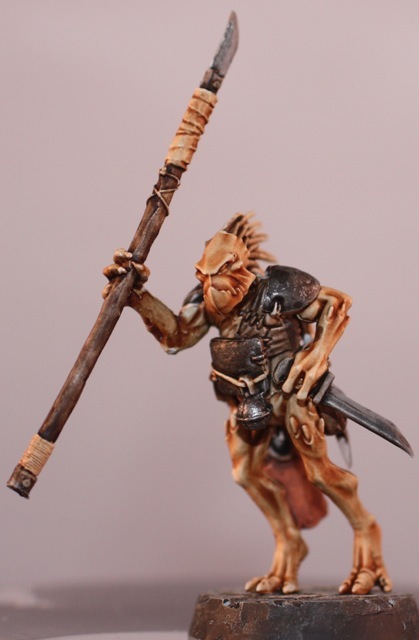 I mixed some thrakka wash into some water effects and painted the mixture over the broken pipes on my resin bases. It took a full day for the water effects to go from a milky green to clear green, but it is worth the wait. The bottle is large enough that I don't think I'll ever run out of it either! 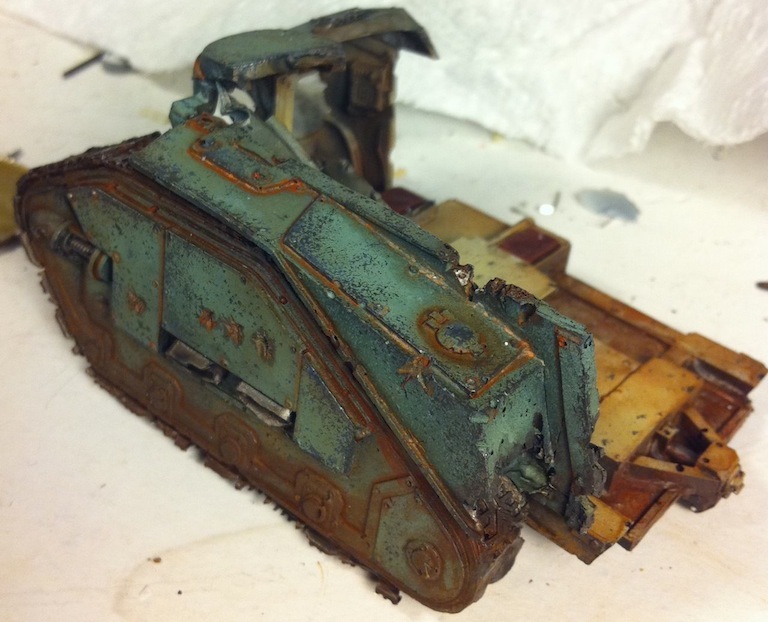 I tried out wet weathering powders on this centaur, and quickly discovered that mixing the powders with thinner was a bad idea. I skipped a crucial step in the FW master class book. 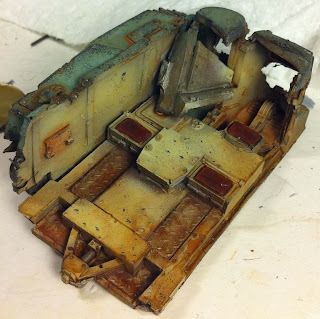 It is really important to seal the model before moving onto further steps in the weathering process. I managed to get away without too much paint damage, but it could have been a lot worse. The dark metal panels in the floor took the brunt of the thinner, and it shows. I think I may try to make the tank more minty colored. I am beginning to think that my DKOK should be on desert bases, which would contrast really well with a darker color scheme. Imagine this tank with dust sprayed around the tracks, and the right side of the centaur embedded in a sand dune. 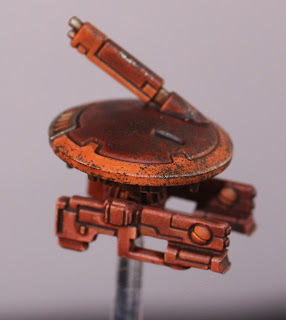 I took a break from my tau to paint up an objective marker for my DKOK army. 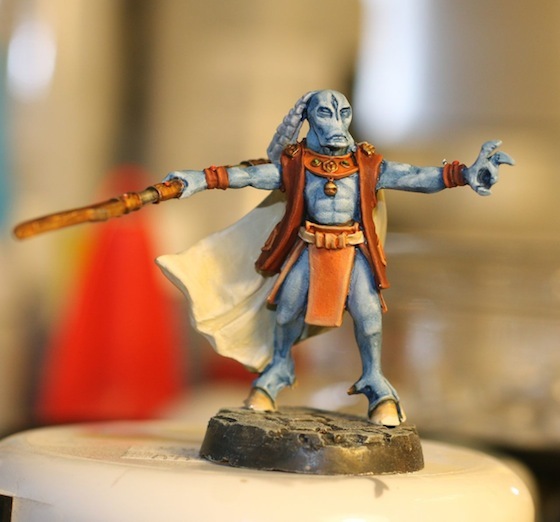 I have all of the miniatures now, and am just working our color schemes. To that end, I present my mint green and bone colored ruined centaur assault vehicle. The right side of the vehicle will be buried in mud. I haven't put the weathering powders on yet, but I am already pleased. 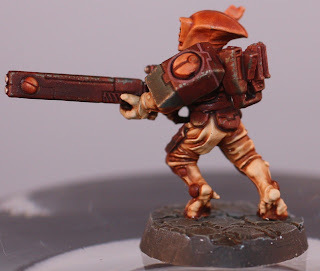 I think scab red is going to be a really good accent color on these. 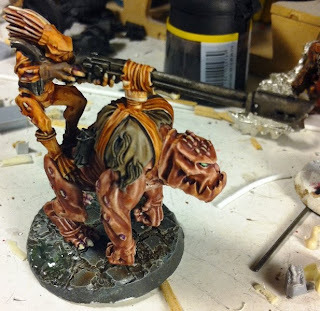 My army has 6 Centaurs, and I am considering making ruined versions of all of them. The centaur itself is just an amazing vehicle. 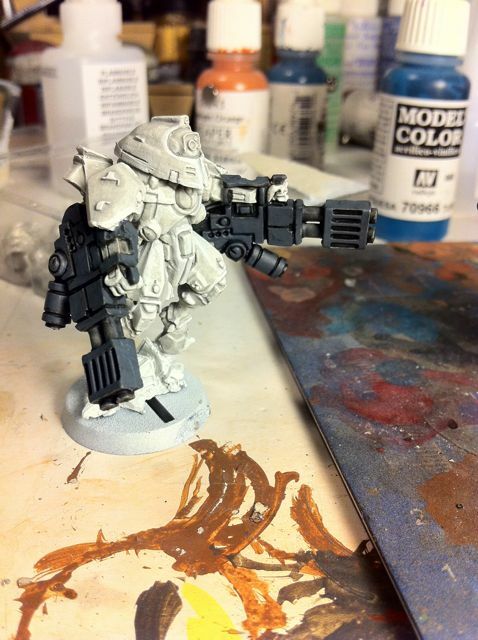 Open topped, a heavy stubber, and a weapon mount for the squads heavy weapons. My company and platoon command squads in addition to 2 engineer squads, commissar general, and quarter master all get them.